This article appeared in a shorter version in The Art Newspaper's September issue. There might be less money to organize exhibitions in many museums, but by borrowing one masterpiece, putting it on display, and so turning a single work into a star attraction – all by itself – several are stretching their budgets a long way. Titian's La Bella, 1536, a portrait of a noblewoman in a blue dress, has been borrowed by the Kimbell Art Museum in Fort Worth, Texas, from the Galeria Palatina at the Palazzo Pitti in Florence ("Woman in a Blue Dress", until 18 September). It will then travel to the Nevada Museum of Art in Reno this month (24 September-20 Novem­ber) and on to the Portland Art Museum in Oregon in November. Caravaggio's "The Fortune Teller" at the Speed Art Museum. Photo by Kertis Creative. Meanwhile, the Capitoline Venus by Praxiteles, around 360BC, has spent the summer at the National Gallery of Art in Washington, DC, on loan from Rome's Musei Capitolini (until 5 September). In November, The Medusa, 1630, Bernini's Baroque masterpiece, is due to be displayed at the Fine Arts Museums of San Francisco, also on loan from the Capitoline museums (19 November-19 February, 2012). And the Cedar Rapids Museum of Art, Iowa, looked to the Brooklyn Museum for its single-work show, borrowing Charles Willson Peale's portrait of George Washington, c 1776-81, billed as "An American Masterpiece" (until 31 December). New York's Frick Collection, combining the trend for single-work shows with another recent phenomenon, the collection-based exhibition (The Art Newspaper, March, p1) this summer displayed its re-cleaned St Francis in the Desert, around 1475-78, by Giovanni Bellini, under the title "In a New Light." Creative use of smaller budgets for exhibitions is one driving force behind this trend. Museum directors say that lending fees, design, insurance and transport costs for a single work are minuscule compared to a big thematic or an in-depth show for a single artist. Marketing tends to be the main expense, leaving museums in control of spending as much or as little as their budget allows. Directors also cite another virtue of single-work shows: they encourage people to really look, rather than move on after a few seconds to the next item on the gallery walls. "We use them to teach how to experience a great work of art and see why it is a masterpiece," said Brian Ferriso, the director of the Portland Art Museum. In 2009, when Ferriso arranged to bring Raphael's La Velata, 1514-15, to Oregon from the Palatine Gallery, "people sat for ten to 20 minutes looking, and often they'd come back after going through our Renaissance galleries," he said. Last year the Portland borrowed Thomas Moran's vast canvas Shoshone Falls on the Snake River, 1900, from the Gilcrease Museum in Tulsa, Oklahoma. Soon it will have La Bella. Charles Venable, the director of the Speed Art Museum in Louisville, Kentucky, is also an enthusiast. In 2008, when the museum presented Medieval and Renaissance Treasures from the Victoria & Albert Museum, he pulled Leonardo's Forster Codex, from the show and exhibited the late 15-century notebook separately. Pleased with how that was received, he has started an ongoing "Masterpiece Series." 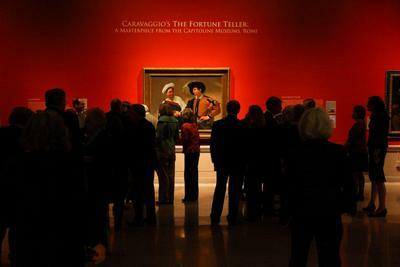 This summer, the Speed exhibited Caravaggio's The Fortune Teller, around 1594, from the Capitoline museums. Venableis now negotiating the loan of a sculpture, thematically linked to the Kentucky Derby, for a show next spring. The phenomenon is not restricted to the U.S. All the year, the Dulwich Picture Gallery outside London has been marking its 200th anniversary with a "Masterpiece A Month" program, borrowing Vermeer's A Lady at the Virginals with a Gentleman/The Music Lesson from the Royal Collection last March, Ingres's Comtesse d'Haussonville from the Frick in July, and – coming up – Domenichino's The Adoration of the Shepherds from the National Galleries of Scotland in December, among others. The Prado in Madrid, in a series called "The Invited Work," borrows one painting from another museum and shows it to illuminate its own masterpieces. Although as Eric M. Lee, director of the Kimbell, says "People receive these shows very well," some directors say privately that some of their trustees have needed convincing, worried that visitors—primed for blockbusters—will not come to see just one work. Media coverage has therefore proven to be important in attracting visitors, which means that the works really must be masterpieces. Pricing has also been important: Portland overreached when it tried to charge $17 to see the Raphael, in hopes of getting visitors to purchase memberships. La Velata drew better attendance at museums in Reno and Milwaukee, where admission was not increased. "Exhibitions that feature one great work or a small group of related works are definitely going to be seen more and more," said Venable. "As larger exhibitions just become too expensive for many museums. Less is more might prove itself true again."